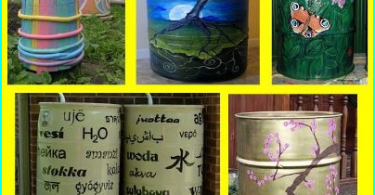 Water from the well to the house: how to make the borehole water system? One of the conditions for a comfortable suburban lifeIt is a reliable water supply to the cottage. Since the central water supply for the city - a rare phenomenon, the question of establishing a system of autonomous water supply site owner has to decide. Water supply of private homes of the well - one of the most convenient ways to provide everyday comfort. 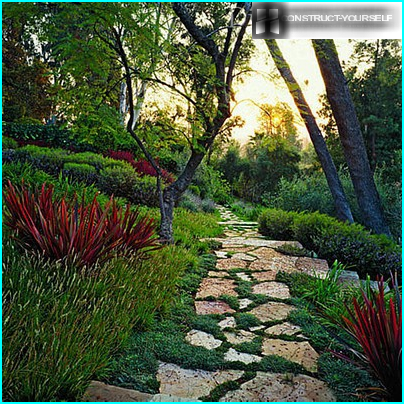 For the arrangement of the water systemwells can be used as sand and artesian spring. With the help of a sand hole easily solve the problem of water supply in the country site, at which the average water consumption does not exceed 1.5 cubic meters / hour. This amount is enough for a small house. But for a country cottage, where there areall year round, sandy hole - not the best choice. The depth of the aquifers in the regeneration of these wells does not exceed 50 meters, which is not a guarantee of water purity. Although the water in the well and sand cleaner than the well, but it may contain various impurities and corrosive compound. The reason for this is the close proximity of the sandy aquifer with respect to surface water. Performance wells is relatively small (on average about 500 liters), and the durability is low - about 10 years. 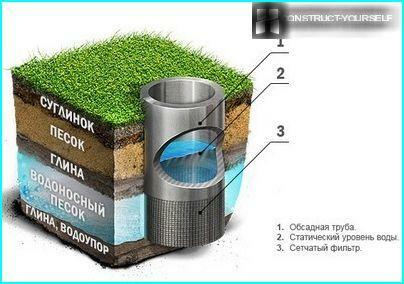 Best option - artesianwell, which is equipped at a depth of 100 meters or more. The main advantage of this well is an unlimited supply of high quality water. This well is capable of delivering up to 10 m³ / h. This is enough to provide water to a large portion of the house. And the life of such a source, even with active use may exceed half a century. If sand wells can be drilled andequipped with their own hands, that in the regeneration of an artesian well is necessary to involve experts. Although the cost of drilling an artesian well is high enough to save on this is not necessary. Instruct this stage of the work must be professional drillers, which, depending on the composition of rocks occurring at the site, identify the aquifer and well equipped with all the rules of drilling technology. 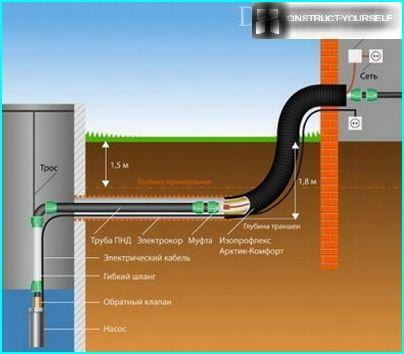 Thanks to the professional approach in the regeneration of the well, you save yourself from a lot of problems in the operation of the system during operation. 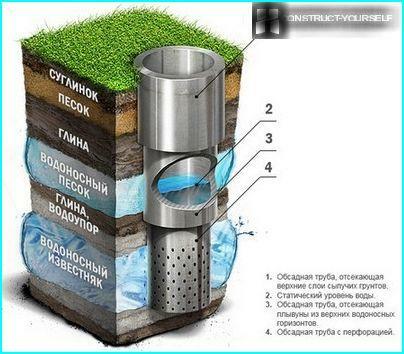 Technology arrangement of water wells with their own hands, depending on the depth of the source and its characteristics. One of the key elements in the arrangementwater system the pump is on the site, which will provide uninterrupted rise and the flow of water from the well to the house. sufficient to establish the unit with a diameter of 3 or 4 ?, equipped with additional protection against "dry run" for the arrangement of battery wells. This would prevent overheating and damage in the event of the pump source in the minimum water level. from the well water technologyalso provides for the installation of a plastic or metal tank - caisson, which is placed so as to have easy access to it, but at the same time prevent the ingress of dirt or water from the external environment. It is required to connect the pump in the well and further control it during operation. When constructing water pipeline from the well to the house,it is used most often 25-32 mm diameter tube of metal - a polymeric material which is easy to bend and has high resistance to the development of corrosion. 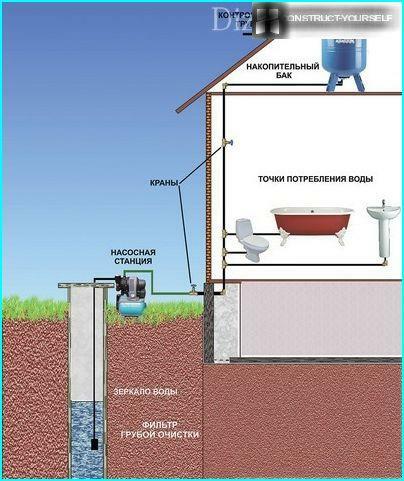 Construction of water supply system is impossible withoutsewage, which includes the installation of a septic tank with a receiving chamber and wastewater treatment systems. sewerage system arrangement technology detailed in a separate article. Due to the shallow section of the well, ifallowing the water level in the source, the pumping station set or a hand pump. 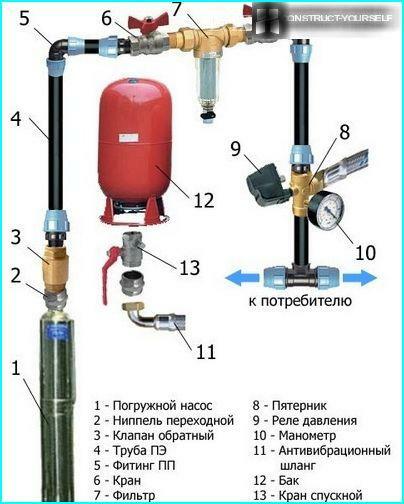 The essence of the automated system is that under the influence of a submersible pump in the water is pumped hydropneumatic tank, the capacity of which can vary from 100 to 500 liters. 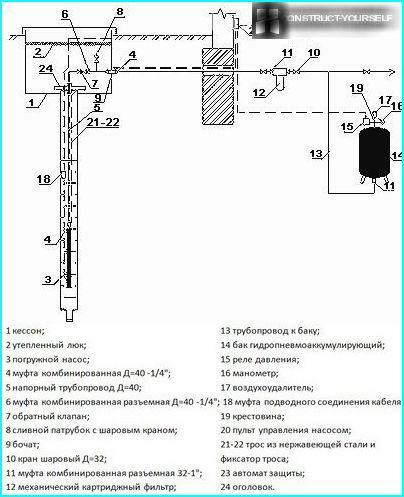 The very capacity divided vodonakopitelnayaa rubber membrane and a relay, through which regulated water pressure in the tank. When filling the tank pump is switched off, if the water is consumed - is signaled on the inclusion of the pump and the pumping of water. This means that the pump can operate on directly by feeding water to the system and after reducing the pressure in the system to a certain level to replenish "stocks" gidropnematicheskom water tank. Himself receiver (tank) is placed in any convenient place at home, often in the back room. From the caisson to the place of entry into the house lay the pipetrench, the bottom of which lay out a water pipe and electrical cable for the pump power. If possible, it is better to buy an electric heating cable, which in addition to the direct appointment will protect the water pipes from freezing. 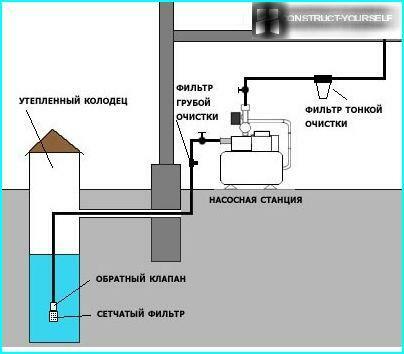 In this way, a deep water pump pumps water from a well in the storage tank, which is placed on an elevated point home. Due to the placement of the tank on a hillIt creates the effect of a water tower, in which due to the height difference between the hydraulic tank and connection points there is the pressure when the 1m water column is 0.1 atmosphere. The tank may be made of stainless steel or food grade plastic. Cylinder capacity - from 500 to 1500 liters. The larger the tank, the greater the supply of water: in the case of a power outage, it will flow by gravity into the valve. Setting end float switch will allow for the automatic start of the pump at the time of lowering the water level in the tank. When choosing a pump, should be consideredwell performance. Despite the fact that the capacity of the unit will only affect the filling rate vodonakopitelnogo reservoir when choosing a machine is better to start from the maximum level of water consumption in the home. Deep pump with electrical cable and pipelowered into the well, hanging it on a galvanized wire rope with a winch, which is mounted inside the caisson. I needed to maintain pressure in the system and prevent the pumping water back into the well, a pump disposed above the check valve. After installing all the elements of the system can only check the internal wiring to the connection point and connect the equipment to the control visor. The total cost of the automation systemwater is about 3000-5000 dollars. It depends on the depth of the source, type and amount of water intake pump points inside the house. From 30% to 50% of this amount is spent on engineering infrastructure system, the rest of the costs - in the elements that determine the level of living comfort.